Our price alerts are a key feature of our services, which allow you to focus on more important aspects of your cruise search. We use artificial intelligence and big data to monitor all price drops on all sailings across the industry, and notify you in real-time about new cruise deals. It’s a simple, easy, free service that functions with a single core purpose: to make your booking process as hassle-free as possible. Why should I use price alerts? Market transparency: Get a clear overview of the absolute best cruise deals available at any given moment. Ease of mind: Because the alerts are automatic, all you have to do is configure the settings of your alert, sit back, and relax. 100% free: Our alerts are totally free - all you need to do is register for an account, which is also free. We’ve got something of a pattern going on here. How can I use price alerts to get the best cruise deals? Go to Find Your Cruise and use our search to find your ideal cruise. If you’re not logged in, you’ll be asked to log in with your email and password. If you still need to register, take a minute to create your free account to continue. Specify what you’d like to be alerted about, including specific cabin categories or room types, price drops, availability. You can also set your budget, so you won’t receive alerts about changes outside your price range. For more details, see the next section. How specific can I really get? As you can see, the alerts allow you to be as general or specific as you like. Under “Cabin Type,” you can select which cabin category (Interior, Oceanview, Balcony, or Suite) you’d like to receive alerts about. For each cabin category you select, you’ll receive notifications on the price changes affecting the cheapest cabin type in that category. For each detailed cabin type, like “OA”, you get information for this individual type. You can also expand each category by clicking on “show all cabins.” Here you can select which specific room types you would like to be notified about. You can also select the type of change you’ll receive alerts about. Price drops and price increases inform you about changes in price, and you can also choose to be notified when a cruise or cabin type is sold out or available. There is also an option to set your maximum budget. 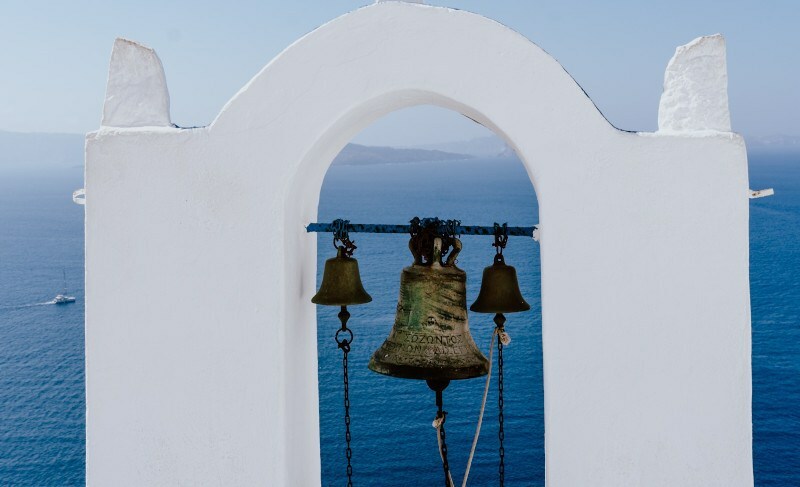 We’ll inform you when prices cross your budget threshold, so if you’re looking for a luxury cruise on a shoestring budget, be sure you define your price point in your alert! Please be sure to add cruisewatch.com to your email address book so it doesn’t accidentally wind up in your spam folder. The alert will also be saved under “Alerts” in your MyCruisewatch account, where you can modify it or delete it to be sure you’re getting only the most relevant information and updates for your needs. When you click on “Alerts” in your MyCruisewatch dashboard, you’ll see a table with all of your alerts. 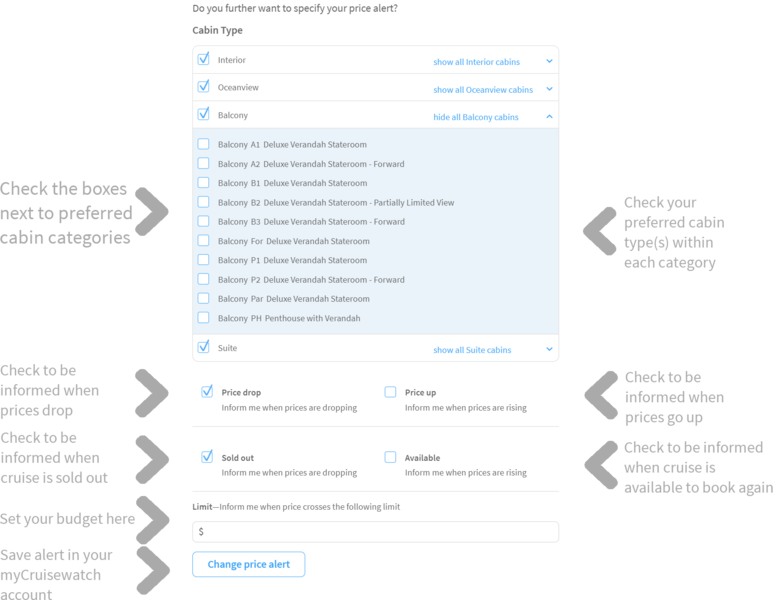 You can expand each alert to see details about the sailing, modify your budget, and select pricing and availability check boxes to change the specificity of your alerts. You can also pause alerts or delete them from your MyCruisewatch account. Click here to find your cruise, and happy cruising!